Leave nothing to chance this Thanksgiving! Take Control of Thanksgiving Dinner guides you through every step of preparing a traditional Thanksgiving meal of roasted turkey, stuffing, mashed potatoes, cranberry sauce, candied sweet potatoes, and pumpkin pie. Includes vegetarian options, last-minute tips, a detailed schedule, and much more. 104 pages. 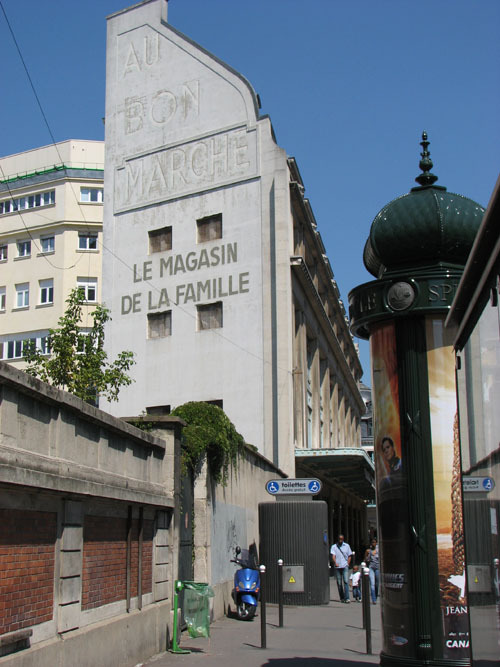 During our first several weeks living here in Paris, we became accustomed to shopping at either of two local supermarkets, a Monoprix and an ATAC. Both of them have a pretty good selection of the basics, though their prices are typically higher, and their freshness typically poorer, than any of the outdoor markets. Still, there were a few items we’d been unable to find here in our neighborhood, such as baking soda and baking powder (yeast is easy to come by, but not chemical leaveners), Swiffers, good sun-dried tomatoes (the brands we could find were all way too salty), respectable soy sauce, and a few alcohols (you know, gotta have Lillet Blanc for our Vesper martinis). As Morgen wrote a few weeks ago in Truffles for Breakfast, we found all these items and much more at a famous old supermarket called La Grande Épicerie, which is part of a larger shopping complex known as Le Bon Marché. La Grande Épicerie has one of the widest selections of any supermarket I’ve seen in any country. I’ve been in larger supermarkets and fancier ones, but the breadth of options here is what truly struck me. They have numerous foreign food sections, for example, so if you’re looking for Italian pasta or coffee, British specialties such as Marmite, Spanish spices, Thai coconut milk, or American staples such as marshmallow creme, popcorn, cream of mushroom soup, and maple syrup, you can find it all here. And, naturally, a full array of produce, meat, seafood, dairy products, frozen and canned goods, and everything else. Plus some awfully attractive pastries and desserts. Nearly everything food-related (and a few non-food items) we’d ever said we wished we could buy but couldn’t find elsewhere in Paris, we saw at La Grande Épicerie. If you’re a food geek in Paris, and particularly if you’re from outside of France and homesick for special foods, this is somewhere you must visit. We’ve heard several people complain about the high prices at La Grande Épicerie, but most of the items we were interested in were quite reasonably priced—some considerably cheaper than at Monoprix. On the other hand, you’d have to pay the equivalent of about US$7 for a single large sweet potato (ouch! ), eggs were terribly overpriced, and a few other items just didn’t seem to be worth what they were charging. So you have to shop carefully, but then, if you need something that simply doesn’t exist anywhere else in the city, it’s likely cheaper to buy it here than having it shipped from North America. 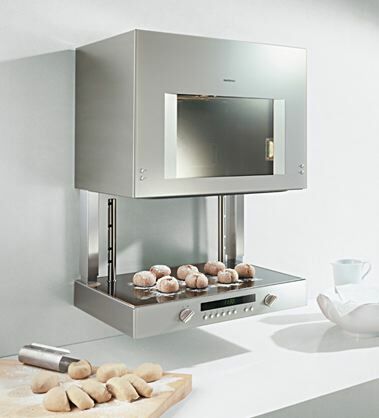 I’ll say this about Gaggenau’s new Lift Oven design: it looks cool. At the touch of a button, the bottom of the oven descends to enable you to add or remove items—a clever solution to the problem I’ve frequently encountered of the oven door getting in the way, particularly in cramped kitchens. This design could plausibly prevent some charred forearms, and in that sense I think it’s marvelous. Plus, you know, many bonus points for the geek factor. Since this oven isn’t actually shipping yet and I haven’t seen one in person, I can’t say how great the real-life experience of using it will be. But a couple of things give me pause. First, there’s this statement: “Since heat rises, the heat remains in the oven cavity, resulting in minimal energy loss during the lift operation.” I’m not sure I find that entirely convincing—but I suppose it depends where the heat is coming from. This oven has 11 heating methods, presumably some of which involve the heat coming from below. In those cases, I have a hard time seeing how this oven would lose less heat when the bottom is completely extended than a conventional oven with the door open. Notwithstanding the fact that heat rises, that hot air has to be contained somehow, and three walls would seem to do a better job of that than one. Still, when the heat is coming from above or from the sides, I can imagine this design would work quite well. Second, the picture shows rolls being placed directly on the floured bottom surface of the oven—not on a baking sheet or rack of any kind. OK, great that you don’t have to clean one more thing, but…won’t that surface get, you know, hot? Won’t that be sort of hard to work with, particularly when you’re doing multiple batches of baking? Of course, you don’t have to bake directly on that bottom (ceramic) surface. Grill shelves, baking trays, and grill trays are available as accessories. You can attach these optional shelves at various heights (on those two round metal supports in the back), and up to two of them can fit at once (so you can bake on two separate racks at once, or grill something on an upper wire grill shelf while using a lower tray to catch drippings). But still…I have to wonder if this will be as convenient to use as all the technology suggests. I came to France for the bread. There, I said it. OK, I had lots of reasons for moving to France, but even though I joke about it, it’s absolutely true: I have what some might call an unnatural fondness for traditional French breads—especially baguettes. I’ve gotten into several arguments animated discussions recently about whether one truly can’t find a decent baguette anywhere in San Francisco. My position has been, and remains, that I personally was unable to find any, despite considerable looking (that is to say, tasting). There were breads that looked like baguettes and even smelled like baguettes, but they Just Weren’t Right. In other words, they made the wrong sound (or none at all); an incorrect texture was simply a natural consequence. I mentioned the sound of baguettes three years ago on Interesting Thing of the Day, and this summer, in the movie Ratatouille, Colette spelled it out during a lecture to Linguini: it’s not the appearance or smell of a baguette that lets you know it’s fresh, it’s the sound it makes when you break it in half. Right on. So what’s the problem? 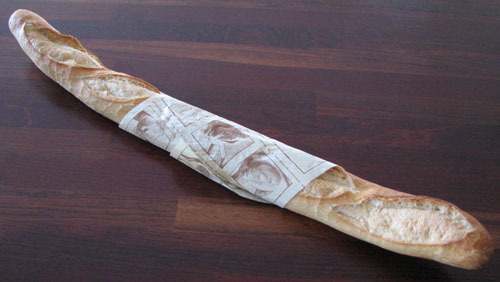 Since moving to France I’ve had a lot of baguettes that were excellent, though very different from each other. I’ve had exactly one decidedly substandard baguette (yes, it’s possible, even here). And I’m confident in my ability to distinguish good from bad baguettes. What I’ve discovered I can’t do at all is to discern which of half a dozen great baguettes is the best. On the Baguette Perfection Scale, I can tell the difference between a bread that scored a 3 and one that scored a 7. But when the choices range from 9.1 to 9.9, I’m totally out of my league. It’s very much like wine: I can tell a lousy wine when I drink one. But my palate isn’t refined enough to distinguish a merely good wine from a fantastic wine. Particularly if I’m trying them on two separate days—side-by-side comparisons are definitely easier. One of our local bakeries sells two species of baguettes: the “normale” variety (pictured here) and the “traditionnelle” variety, which is shorter, denser, chewier, and more expensive. I like them both equally, for different reasons, and can’t even come close to deciding which is better. Likewise, we’ve had fresh (normale) baguettes, hot out of the oven, from at least four different bakeries. We’ve smiled, we’ve sighed, we’ve moaned. But I am completely unable to compare them in quality. And yet, clearly there are lots of people who do make such evaluations and who, moreover, agree with each other (“Oh, everyone knows X’s bread is way better than Y’s bread.”). How do they do this? Obviously, I need a great deal of practice. Contrary to what every cookbook instructs, I’ve frequently cooked pasta in the following unorthodox manner: put the dry pasta and just enough water in the pot, turn on the heat, and turn it off when the liquid is all absorbed. In other words, somewhat like the way you cook rice (though uncovered). No draining, no getting a colander dirty. Add the rest of your ingredients (think: cheese) in the same pot, cook a while longer, and your meal is done. I didn’t invent this technique as a way of advancing the culinary arts. I started doing it partly just to see what would happen, but mostly because I was lazy. And, for my applications, it worked just fine, with the proviso that one must stir the pasta frequently and watch that evaporation carefully—if you don’t turn off the heat just before the last of the water is gone, the pasta sticks to the pot, which is not what you want. But the bottom line is that I felt I was saving myself a bit of effort and, as far as I could tell, the end result tasted every bit as good as pasta cooked the conventional way. Maybe even better. Yes, I know that a certain amount of starch that would otherwise have gone down the drain went back into the pasta, but I haven’t been able to detect any negative impact from that starch on the pasta’s taste. Well, it seems that great minds think alike. No less a chef than Alain Ducasse (yes, French, of course) has developed a “new” and revolutionary way of cooking pasta, which is essentially just to do everything in a single pot without any draining. He calls this technique the Pasta Pot. And, OK, I’m oversimplifying a bit. Using Ducasse’s method, you’d typically start by briefly sweating some aromatics or greens in the pot, then adding your dry pasta and sautéeing for a few minutes, and finally pouring in some stock or other flavorful liquid and cooking, uncovered, until the liquid is gone. I have no quarrel at all with the method, of course, since it validates what I was already doing all along. 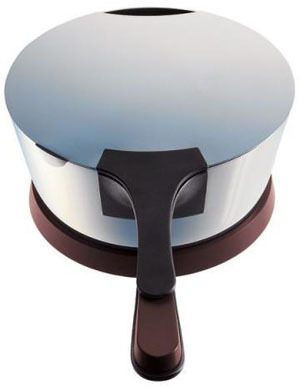 But what I do have trouble with is a new piece of Alessi cookware designed expressly for Ducasse: the (eponymous) Pasta Pot. It’s this, you know, stainless steel container that sits on your stove and holds ingredients while they cook. It has a removable cover, and a melamine trivet on which you can place it when it’s not on your stove. The only thing that makes the design unique is that its handle doubles as a spoon rest (spoon included). And for this, the retail price is $238. Naturally, they’re currently sold out, but you can be put on a waiting list. If you have money to burn and style is the most important consideration, hey, knock yourself out. I’m sure it’s as good an all-around pot as you’ll find anywhere else. But you can employ the Pasta Pot method just as well with any $30 pot, too. 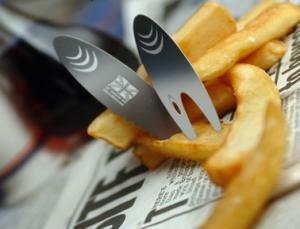 With the money you save, you can buy yourself an appetizer at one of Ducasse’s restaurants. To read what another Big Name in Cooking had to say about pasta, see Pronunciation and Pasta. As I mentioned last week on Truffles for Breakfast, I recently paid a visit to Vert d’Absinthe, the only store in Paris devoted exclusively to absinthe and its various accouterments. When the owner asked if we’d like to sample some absinthes, we eagerly agreed. He poured a bit in a glass, put a slotted spoon on top, placed a sugar cube on the spoon, and then positioned the glass carefully under one of the spigots of a device like this one. Although such gadgets are generally called “absinthe fountains,” that term is a bit misleading. In fact, you fill them with ice water and use them to dilute your absinthe. Turning on the spigot, or robinette (various models have anywhere from one to four), allows the water to flow, but only one drop at a time. Yes, this is a type of fountain designed expressly to drip! The idea is that the water must fall slowly enough to dissolve the entire sugar cube by the time your drink has reached the desired level—typically a 4:1 or 5:1 ratio of water to absinthe. Vert d’Absinthe sells the fountains here in Paris; you can also buy them online from such sources as La Maison d’Absinthe and Saxon Gifts, as well as (naturally) eBay. They’re pricey, and of course you’ll pay more if you’re getting an antique model from the early 1900s than for a modern reproduction. But they automate what is otherwise the rather tedious job of drizzling out ice water from a pitcher at a slow and steady rate for several minutes per glass. Before leaving California, I got to sample the latest innovation in energy bars from a local (San Francisco) company: bars you can bake yourself. The idea behind Matisse & Jack’s TrailBlaze Bake-at-Home Energy Bars is that you get the same nutritional benefits of a commercial bar (if not more), but with all-natural ingredients, without all the packaging, and with the kind of fresh-baked flavor you can get only by, um, baking something fresh. Combine the mix with a few wet ingredients, pop it in the oven for a half hour, and you’re off. Two flavors are available: Cranberry Walnut and Chocolate Chip. Now, on the surface, this concept seems sound. Certainly, you can save a bit of money by baking your own bars—so at least there’s that. But I’ve read lots of reviews of these bars that proclaim them the best thing since manna, and frankly, I don’t get it. They’re totally adequate—there’s nothing wrong with them—but in my opinion they completely fail to live up to the hype. Let’s start with the most important thing: taste. They taste fine, which is to say they have yummy ingredients (like chocolate chips—nothing bad you can say about that) mixed in reasonably pleasing proportions. But they do not taste like energy bars. If you’re expecting something along the lines of a PowerBar, or Clif bar, or Balance bar, you’ll be disappointed. These bars are much fluffier, more like a slightly dense brownie than the firm and grainy texture most of us associate with commercial energy bars. And actually…I like that sort of texture. I’d prefer a Clif bar over Matisse & Jack’s any day. True enough: that’s just my personal preference. But I’m saying that it wasn’t what I was expecting, and the difference was so striking that I have difficulty putting these bars in the same category of food as other energy bars. The mixing instructions are kind of weird. There are actually three different suggested recipes, with different combinations of applesauce, plain or vanilla yogurt, water, and/or vanilla extract, depending on what sort of sweetness you’re looking for and whether you need to avoid dairy products. For example, I chose the “less sweet” option, which required combining the dry mix with 1 cup + 3 tablespoons of plain yogurt, 1 teaspoon of vanilla extract, and 1 tablespoon of water. So, I had to get three measuring implements out and dirty, not counting the spoon, bowl, and baking pan. And, using whichever set of ingredients is only convenient if you already happen to have them in your home. What I’m saying is: minus a couple of points for added effort. A lot is made of the fact that these bars reduce packaging waste, but you’re still left with a cardboard box and a plastic inner bag to dispose of. Given that the mix makes 9 bars, I’m not sure you’re saving a whole lot, in terms of square inches of material, over regular bars. And also: think about the time you’ll spend (at least a half hour), plus the water and energy required for baking and washing. I don’t think the net environmental impact is truly smaller. One of the best things about commercial energy bars is that they’re handy. You just grab one and go. You don’t have to individually wrap each one, or find a plastic bag to put it in. They’re packaged in a way that makes sense for athletes and other active people. Matisse & Jack can’t offer you that. In addition, although the bake-at-home bars may taste “fresher,” they only keep for a few days. For better or worse, most commercial bars taste fairly fresh even after months. Now, I hate to be hard on these guys. I know they mean well. As I said, the bars do taste perfectly fine, and I can’t quarrel with their nutritional specs. Plus, lots of other publications have given them rave reviews. So I accept that it’s entirely possible I’m the only one who doesn’t think they’re great. But to be entirely honest, my experience with the bars just didn’t impress me. It’s been quite a few months since posts appeared here on The Geeky Gourmet with anything approaching regularity. Since blog freshness is often measured in hours or days, not quarters, that means this site has been as good as dead—or at least, let’s say, in a state of suspended animation. I feel badly about that. It was never my intention to let the site go, but the simple fact is that I got busy with many other things, and GG was near the bottom of my priority list. Paris, of course, has a lot going on in the world of food. I’ll be mentioning some of that in future posts. I’m not the sort of person who dines out at fancy restaurants every week, though, so look for the same sorts of down-to-earth topics that have appeared here in the past.